It has been a crazy week. The Supreme Court decided to give corporations all the rights of citizens to lobby congress and spend as much as they please to influence the actions of congress. Essentially they gave them the right to buy our government. Exxon will spend millions supporting candidates that support the oil industry and millions opposing candidates who oppose them. Guess who will win? The same can be said for the health insurance industry and the banking industry and every other special interest big buck corporate entity. The interests of the people will be given lip service. The supreme court by their decision has taken the power out of the hands of the people and put it into the hands of the corporate money men. This is the merging of the corporate entity with the state. Mussolini did the same thing in Italy prior to World War Two. Welcome to Facist America. What is Facism? "Fascism, pronounced ˈfæʃɪzəm, is a political ideology that seeks to combine radical and authoritarian nationalism with a corporatist economic system, and which is usually considered to be on the far right of the traditional left-right political spectrum." We have arrived. The corporate mentality is not one of justice but one of greed and exploitation. The Supreme Court has sold our Democracy down the river. As we move more to the Corporate and Right Wing mind set our freedoms will slowly be eroded and we may see the destruction of the middle class in America if this trend continues. It is a dangerous course we are on and one that will erode the freedoms of all Americans for the benefit of the corporate elites. This is a very dangerous path. With the win in Massachusetts the enemy of Americans, Republicans and Blue Dogs, having decent health car seem to think it is over for health care reform. The Democrats can still win this if they have the balls and Obama takes the lead. Of course the staunch Republicans oppose any health care reform for Americans, just so long as Michelle Bachman has her government health care, and Joe Leiberman has his government health care and in fact everyone in congress has their socialist government health care. But lets continue to let the health insurance industry deny people for pre-eisting conditions even if they didn't know they had one. Lets keep on letting the health insurance industry continue to drop people when they get sick and need health insurance. Who the hell needs health insurance anyway? Only congress because we the people subsidize it. Like I said it has been a crazy week and this week promises to be just as crazy. 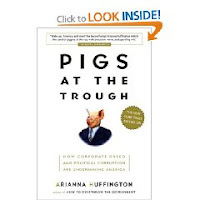 The recommended book seemed to be appropriate in light of the new power given by the Supreme Court to corporations. In a hard-hitting, almost cynical style that I did appreciate, the author attacks companies that have raped the public and their employees because of their own greed. She names them like a littany of indictments that followed their wake: Adelphia, Tyco, Arthur Andersen, Enron, World Com, to name a few. Huffington shows how these once respected companies, their greed, and the relaxation of regulations have allowed them to virtually alter standard principles of accounting so they can hide money and cheat the government, taxpayers and employees. The most important thing Arianna makes clear is that politicians no longer seem to represent the people who elect them, but the interests of the corporations with the largest contributions. (It's called bribery outside of Congress.) This administration has given their blessing with their silence, and has a huge following of people who still believe their gospel while they are getting their own pockets picked. The repudiation of the pension for United Airlines is a perfect example. What did the administration say? Nothing, not a word! But let the poor, little guy declare bankruptcy, and Senator Orrin Hatch and other congressmen of his ilk will be after them on behalf of MBNA, forever. It's strange that neocons who worship at the holy grail of unrestrained capitalism, have little to say about this book, or challenge its contents. For once they cannot retort with that tiresome, insipid lament, "Well, Clinton did...." It's about the greed that this administration, corporate CEO's, and congressmen have fostered and encouraged with sweetheart deals, no-bid contracts, tax breaks, loopholes, secret meetings, and even corporate protection laws. It's about people who never seem to have enough, no matter how much they already have. They will always want more.